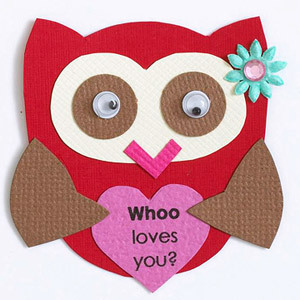 HP Creative Studio has two different sets of Valentine Cards that are perfect for the kiddos to hand out at school. 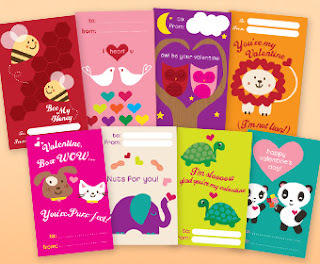 I like the "Animal Love" cards, but the "Better Together" set is super cute and very retro. Xerox has a bunch of cute printables too. Who knew? This set of four cards at Disney's Family Fun reminds me of the cards I used to give out as a child! These guys are really good...they have a huge selection of Valentine themed printables, card ideas and crafts to choose from! Apples for the Teacher has several sets of printable cards to choose from as well as lots of teaching activites, crafts and printable pages. Elle's Studio is offering a free valentine recipe card and tag...perfect for a gift of yummy homemade treats! And although these aren't technically printables, I couldn't resist sharing some super cute Valentine paper piecing patterns from Scrapbooks etc. How cute is this owl? Any more out there to share? Leave a comment with a link!